Hi Mark, Great photography . . . how close did you need to venture to the wasp? Your description takes me back to a question I ponder from time to time — what are the parallels/links between the predatory, parasitic aspect of Nature and the predatory, parasitic aspects of human nature. Hi Jan. About 4″ (working distance – from tip of lens to subject) away for this size creature – once an insect is occupied it is usually so focussed it won’t notice me unless I draw it into sense (or cognizance) by some shock through some form of vibration – or series of. Link? is there is one nature and everything in it is that, right up to the stars. Symbolised by the evolution of the human embryo that transits through forms that ‘we’ once were, and still have the knowledge of, if we can only see – and the space between, inside (and ‘out’). Is there anything in nature that isn’t, at least energetically or psychically, in us … I bet it’s reflected in our dna too. Hi Mark, You must have a very steady presence to get so close to the insect world. Well said about the pervasive unity of Nature! Hi Jan. Relatively steady – presence, being without reference to errant thought or emotion – the only impediment to peace of mind. I want to photograph like you once I get older. Fabulous !!!! Great shots, as always, Mark. 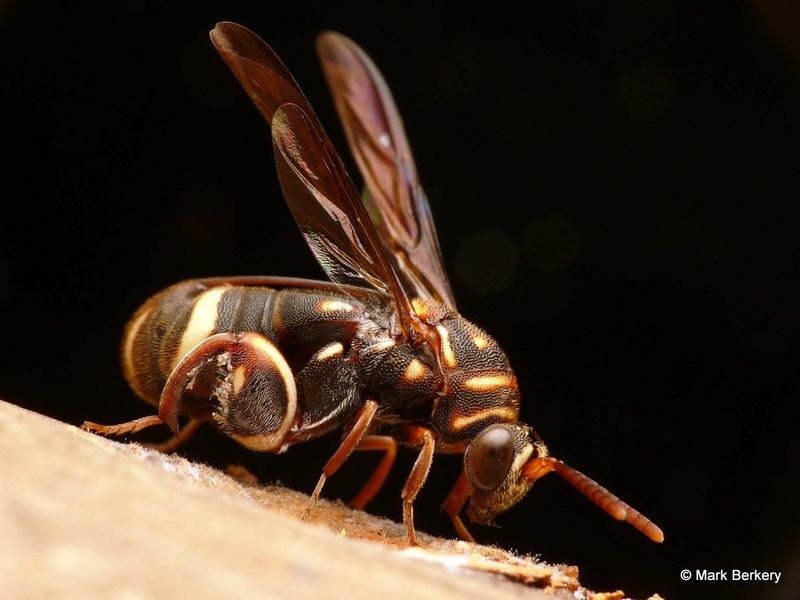 And I appreciate your equanimity toward the wasps, especially given your affection for the bees. whoa, i feel as though i am looking at a super athlete! Thanks Tammie. Apparently, for their size they are super strong creatures, like most insects compared to us. Fascinating and beautiful images, Mark. And I learned what an ovipositor is. Terrific set. Such lovely curves and arcs to its body! 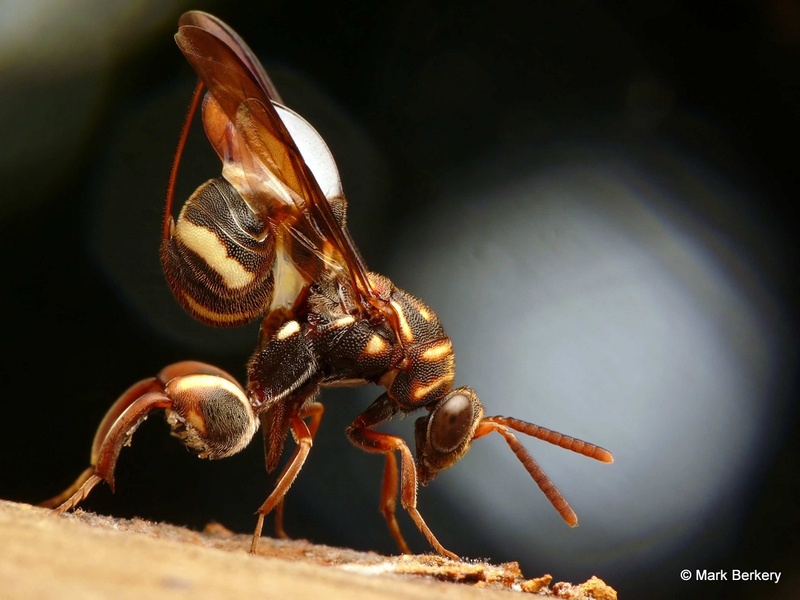 Say what you want about wasps, but they sure have style…they are the Harley Davidsons of insects! They also display the most incredible range of adaptations to their desired niches. I always admire them (from a safe distance). It does look as if the shape of some sportsters could have been taken from such as this wasp. 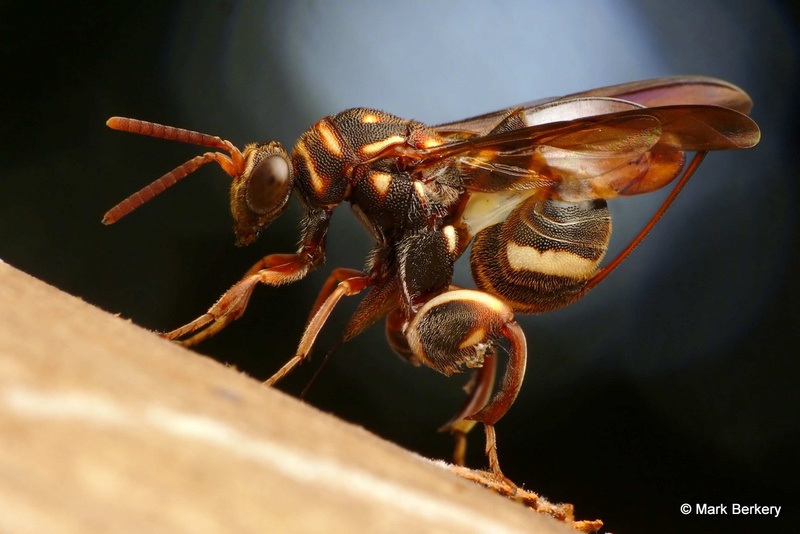 Perhaps from the fact the wasp came first in form and persists in the accessible psyche or subconscious. So beautiful pictures! like to see these insects with all the details and to see what the nature creates. Thanks Therese … Ingenious nature. Remember to click pix to see bigger, is better in this instance, on this blog. Thanks Julie. Can’t beat nature for material to shoot.